Owning horses means you have to find the right land to house and ride them. If you don’t want to keep them a few miles down the road or further, you’ll want to invest in a piece of property suited for horses. If you already own an equestrian property you know how much work goes in to finding the right spot. From zoning requirements to land quality, there are a number of factors you’ll need to take into account. •	Storage area: Is there sufficient storage and stall area? Be sure your needs are being met without renovations. •	Renovation potential: If you want to renovate, consider where that puts your budget. While the property may seem like a good price, it’s critical you consider how much you’ll need to spend after the fact. •	Resell value: If, in 5 years time, you want to move on, will the property be just as valuable, more or less? If there are no buildings on the land, you’ll need to assess the land as it sits right then. There needs to not only be room for the animals and equipment, but new stalls, barns, fencing, etc. There are a variety of aspects that you should assess, and stick firm to, right away. •	Size: In case there aren’t already proper buildings in place, be sure you have the space for all the structures you’ll need to build. •	Geography: The environment should be suitable for grazing and riding. If possible, find property with tall trees for shade. •	Zoning: Consider how many horses you have now and how many you hope to have in the future. 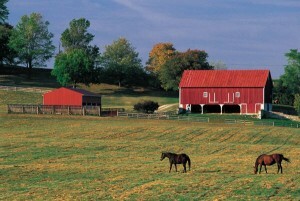 Zoning varies from town to town, so be sure that you are set in the event that you want to have more horses. “Environmentally speaking, the golden rule on horse properties is to “keep clean rainwater clean” by diverting it away from paddocks, buildings, manure piles, and high traffic areas.” Be sure this will be possible. If you want to keep your horses close by, you’ll need to purchase the right kind of property. When choosing which equestrian property will be best, there are a number of factors to consider including land quality and zoning requirements. Be sure to assess the whole picture before making your final decision.